Welcome to Dame Salon Spa, how can we make your day? Dame Salon Spa is located in downtown De Pere amongst unique shops, restaurants and specialty businesses. Our home at 620 George Street has been transformed into an urban chic, downtown experience. 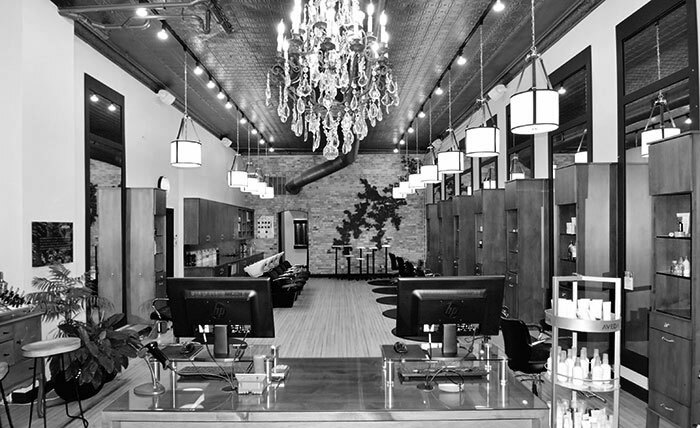 Our design focused salon features the original 100 year old hardwood flooring, 15 foot high embossed tin ceiling and natural exposed brick. A grand full length front window brings light and energy into our space. Beyond the vitality of our salon, you are welcomed into the tranquil environment of our spa. Attention to detail has distinguished us as number one in the area. Our luxurious pedicure chairs, waterfall and spa room fireplaces are here to enhance your experience. Let us be your happy place. Your favorite getaway to relax and rejuvenate. Team DAME is comprised of 16 rock stars who are ready to make your day.